Every single thing, even the voting options, are repeats of previous deals in the sale. Tomb Raider is of note because it's been cheaper on Amazon during this Steam Sale. Voting is all sports, so you'll have to ask Owen. It's also all repeats. • Community Deal Super Meat Boy ($3.74) | Repeat, awesome game of course, you probably have 3 copies already. • Flash Sale New Vegas ($2.49) | Repeat, buy the Ultimate Edition. Also the link seems to be broken. • Flash Sale FTL ($2.49) | Repeat, easy buy. • Flash Sale Hitman Absolution ($6.24) | Repeat, and not the cheapest the game has been. • Flash Sale Star Conflict Elite Power Pack ($40) | Got nothing, but at least it's not a repeat. 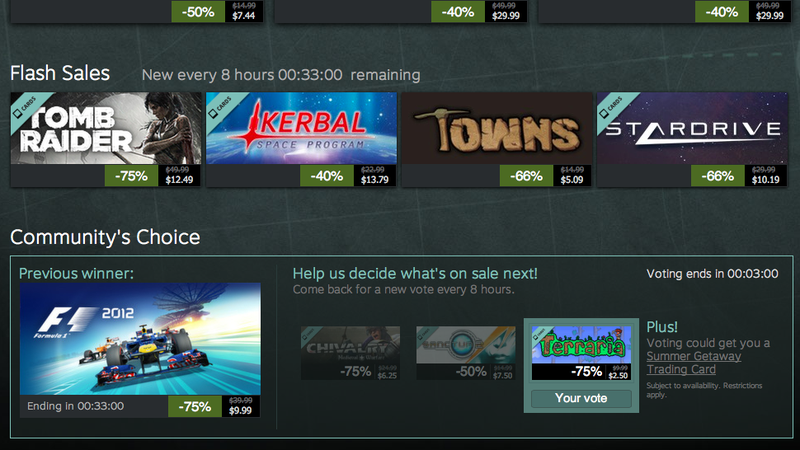 Voting for Runner2 even though it's a repeat, because RCR and Meat Boy are on sale all the time. • Community Sale Bully ($3.74) | Repeat. Buy it. • Flash Sale Portal 2 ($5) | Game of the generation? Quite Possibly. Repeat? Yes. Been bundled for cheaper? Yes. Should you buy it anyway? Yes. • Flash Sale Fable III ($5) | Where's the Fable II sale? • Flash Sale Rayman Origins ($6.79) | Amazing game, good price, I might actually recommend getting a console version for couch co-op though. Update: You can in fact do couch co-op on the PC version if you've got the setup for it. • Flash Sale Star Trek ($7.50) | The other white Aliens: Colonial Marines. I would have liked to have seen this for a $1 0r $2, because you know, this is supposed to be a Steam sale. • Lead Deal Skyrim Legendary ($36) | Repeat, good deal. • Baldur's Gate Enhanced Edition ($5) | Has been this price many times, but go for it if you want it. • Train Simulator 2013 ($11) | I've got nothing for you. • Civ V ($7.50) | On sale constantly, but go for it. • Trials Evolution Gold Edition ($10) | Probably the second most exciting sale today after Monaco. • Monaco ($7.44) | It's the one everyone has been asking for. • Metro: Last Light ($30) | Repeat, but go for it. • Eve Online ($5) | This is actually a starter pack. The game has a subscription fee after the first month.